I consider myself to be a fairly intelligent human being. However, last night after spending 30min trying to get my back wheel back onto my bike, I felt like I was the lowest common denominator of intellectual organisms. In other words, the neon tetras in our fish tank were mocking me. I gave them the finger. I can handle most basic bike maintenance issues – pumping tires (training and race wheels), changing flats (not the speediest, but I can get it done) – I’ve traveled literally across the world with a bike and can take it apart and put it back together relatively easily (although I have trouble getting the pedals off occasionally. I have a fear that the wrench will fly right into my face when I’m putting unnecessary torque on it). Yesterday, I decided I wanted to ride the bike trainer easy for a short amount of time, basically for as long as it took me to watch something on our DVR. My only problem was I still had the back race wheel on my bike from the triathlon I did a couple of weeks ago. No problem, also in my bag of tricks is the ability to change my cassette. Marty usually does this for me because I give him puppy dog eyes which are equivalent to kryptonite to him, but alas, he was out coaching his high school cross country team in their conference championship. Time to step up and take matters into my own hands. Now remember, I got my new bike at the end June, and have yet to mess with anything on it. This means I hadn’t taken the back wheel off by myself (see ‘Marty’ and ‘puppy dog eyes’ from above). Got the cassette changed no problem. The issue came when I had to get the back wheel back onto my bike. WTF. This does not look like my Felt. Nor does it act like my Felt. Oh I miss my Felt. Why did I ever sell it and buy this hunk of crap? It doesn’t even look remotely possible that the back wheel can fit back on the bike with the chain in the correct place. Why am I so stupid??!! !@*$!!%*! EVERYONE owns a Cervelo. I’m sure THEY can get their back wheel on. Why can I not figure out how to get this back on there?! I graduated as the Salutatorian of my high school for god’s sake. That has to count for something, right? Right? Apparently not as I ended up sending Marty this picture with a caption that read something like this. How the f do I get the back wheel on this bike. My other hand looked similar but I couldn’t figure out how to take a picture of both hands. Tassie was too embarrassed by my stupidity to help me out. Traitor. I decided not to ride last night. Or perhaps I should rephrase, I did not ride last night because my bike refused to wear it's back wheel. did you give tassie the finger? the lowest common denominator of intellectual organisms - great line. outstanding. Oh laughing.. not at you bri.. but with you.. you may just not be laughing.. Well, maybe now you are.. I don't know HOW many times I have found myself sweating, cursing and yelling trying to get that back wheel on. I always forget to put in the "small ring" before I do it so there is less tension on the front rings and then I'm like screwed! Been there, don't that! Bri, You are not the only one. 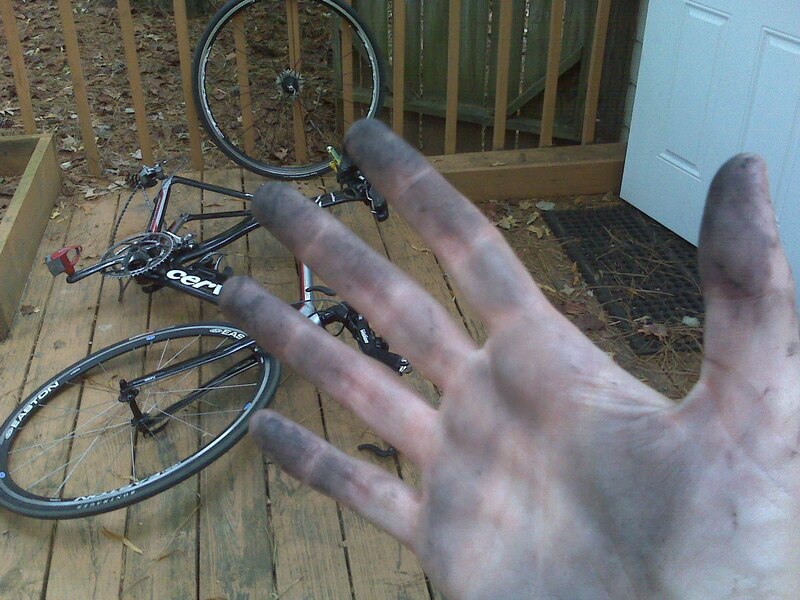 It takes me forever to change my back wheel and my hands look like your's do. If you find a secret let me know, putting the bike on a stand helps sometimes. I still have grease in my nails from Friday. When i first got my Scott I had never had a horizontal drop...I had to go to Utube to figure it out bc its not obvious when i was used to a vertical.... Amazing that there was a U tube video on this...still amazes me! now i have to put it on the stand or i am swearing up a storm too. Trying to get my back tire into the horizontal drops on my specialized made me cry. I literally cried. And I didn't have a husband to help me out because he knows less about bikes than I do. It took me hours and the help of google to get that wheel back in. That's nothing. I seem to recall someone we both know that put her mountain bike front wheel on the bike backwards, causing the brake pad to rub terribly. Then took forever to figure out the problem. With an audience. Now that girl is a dumb@#$#@. Yeah, I am the SAME WAY! Whenever Jerome is out of town or at work I have a mini-panic attack if I have to change something major on my bike. I can do it (barely) but Jerome does it with ease, so I just have relied on him for WAY too long.